Did you understand this first Spanish word? Because it was presented to you using a new technique that is making learning languages easier than ever - the Bilingual Reading. We created this book using this technique so that you can learn Spanish in a fast and fun way and whenever you want. One version will be on the language you want to learn (in this case we will help you to learn Spanish) and the other version will be in your native language or some other language you are comfortable with - here we will use English. Using this method, you will quickly start discovering the meaning of the words in Spanish and accumulating vocabulary that will soon allow you to read texts that are more complex without having to spend hours and hours looking for every word meaning on a dictionary and trying hard to memorize it. In order to make it easier for you to learn Spanish in a fun way, we gathered in a word a very special group of 12 Spanish short stories. 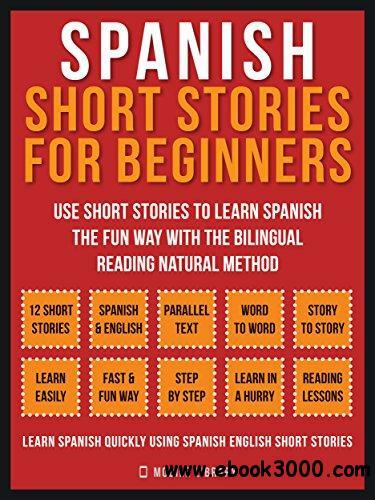 These 12 Spanish short stories for beginners were written using straightforward grammar that is comprehensible for beginners and that will help you rapidly gain more Spanish vocabulary and comprehension. Using Spanish English parallel text, this book will increase your bilingual reading comprehension skills and maximize the time you invest in reading. The book is organized as a Spanish learning book: you can start by reading each paragraph of each story in the two languages (in Spanish English parallel text), then move to read the full story in each language, rereading to consolidate the Spanish fundamentals whenever is necessary. This way you will feel the progress of Spanish language learning when moving from story to story and see your Spanish vocabulary grow as your bilingual reading comprehension increases - allows you to learn Spanish easily and more than that, you can learn Spanish in a fast and fun way. You can even dedicate it a few moments every day so you can even learn Spanish in 10 minutes a day if you want!